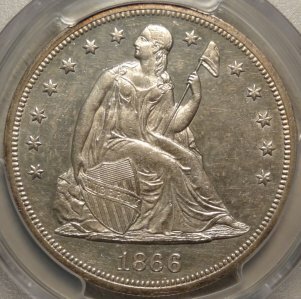 *** AN MJPM FEATURED COIN *** 1866-P No Motto, U.S. Seated Liberty Silver Dollar AU-58 (PCGS)... We have an amazing bright white near proof like example in very choice brilliant almost uncirculated condition to add to your collection of the highly prized U.S. Liberty Seated Silver Dollars. Call us today! 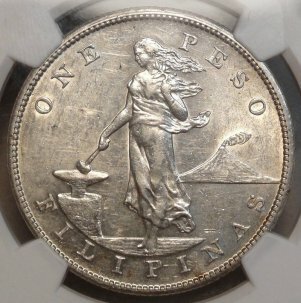 *** AN MJPM FEATURED COIN *** 1906-S U.S.A.- Philippine Peso AU Details (NGC)... The key date to the wildly popular Philippine Peso series. 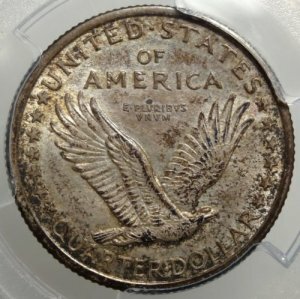 Graded and Certified AU Details/Scratches by NGC. 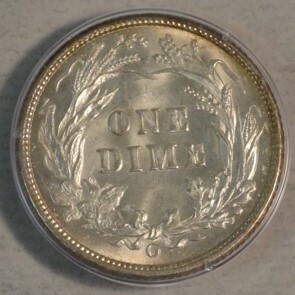 Check out the orginal brilliant mint luster on both obverse and reverse. We feel the graders were exceptionally conservative on the grade in light this is one of the best survivors are principal has seen in the past 45 years! This is an excellent example discounted for the serious collector or investor. 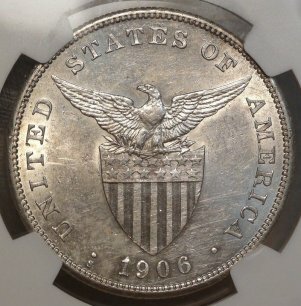 *** AN MJPM FEATURED COIN *** 1916-P U.S. 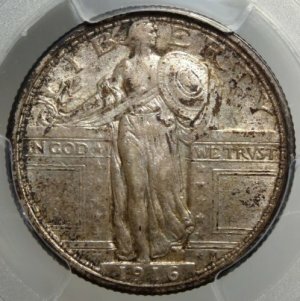 Standing Liberty quarter dollar AU58 (PCGS)...Caution: This stunner may stop your heart! 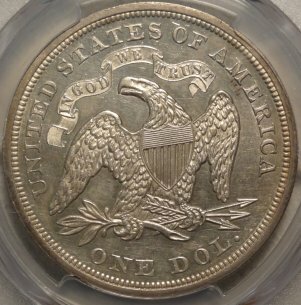 A PERFECT original well struck example of this 20th century rarity from the Standing Liberty quarter dollar series. 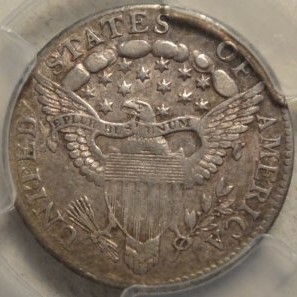 First year of issue depicting the controversial exposed breast with a mintage of only 52,000 coins. Our example is an early strike showing a bold full date, Ms. Liberties fingers and toes! A terrific choice for the better grade and discriminating set. 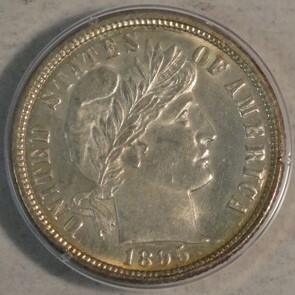 *** AN MJPM FEATURED COIN *** 1895-O U.S. Barber - Liberty Dime MS62 (PCGS - CAC - OLD RATTLER HOLDER WITH A CAC STICKER!)... 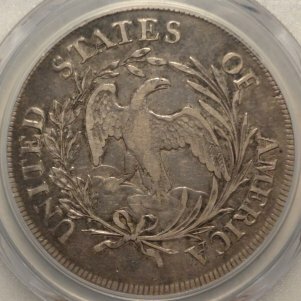 We offer you the RARE opportunity to purchase the very rare key date Barber - Liberty dime in mint state/choice brilliant uncirculated condition with the coveted CAC sticker for approval of quality and if thats no enough - the coin resides in a 1st generation PCGS rattler holder as an added bonus! 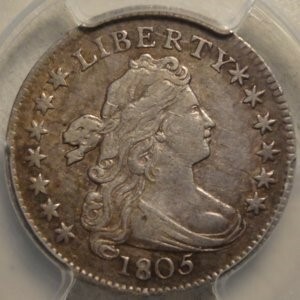 *** AN MJPM FEATURED COIN *** 1805 U.S. Draped Bust Dime Variety: 4-Berries EF-45 (PCGS)... We have a wonderful and very scarce example in very choice extra fine condition to add to your collection of the highly prized U.S. Draped Bust Dimes. Call us today! 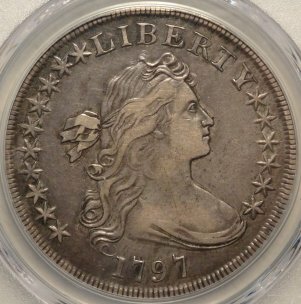 *** AN MJPM FEATURED COIN *** 1797 U.S. Draped Bust Dollar Variety: Small Eagle Reverse, 10x6 Stars Details (PCGS)... We have a very acceptable coin with a lovely choice Extra-Fine plus obverse strike combined with a Extra Fine reverse strike. Please carefully examine our photos. See if you don't agree this is an excellent affordable example to add to your collection of the highly prized U.S. Draped Bust Dollars. Call us today!